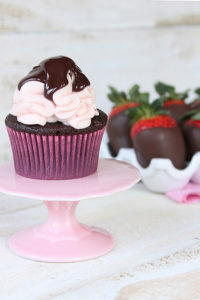 Chocolate Covered Strawberry Cupcakes – moist chocolate cupcakes topped with fluffy strawberry cream cheese frosting and a drizzle of chocolate ganache. A delicious Valentine’s Day recipe by our contributor Lauren Kapeluck of EllenJay Events. 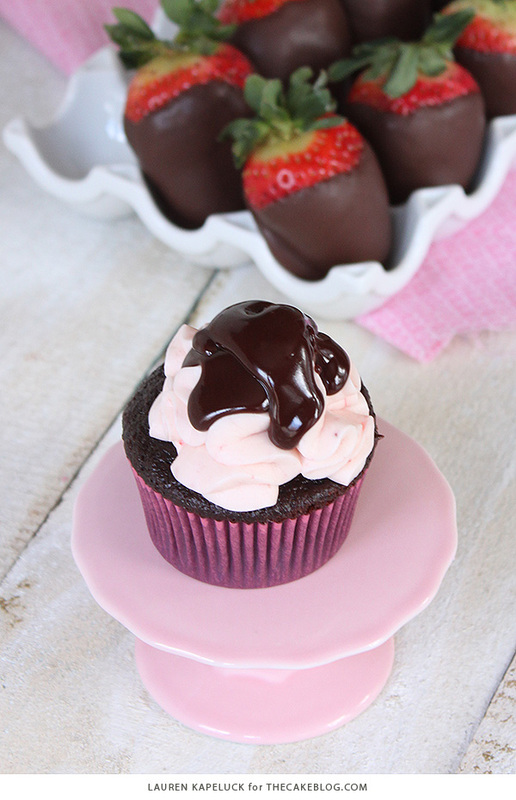 Valentine’s Day will be here very soon so it’s only appropriate to share a recipe that just screams chocolate and strawberries, and well, more chocolate! After all, I’m pretty sure chocolate covered strawberries are a major Valentine’s staple that never disappoints. So why not take that signature dessert and turn it into a cupcake flavor. 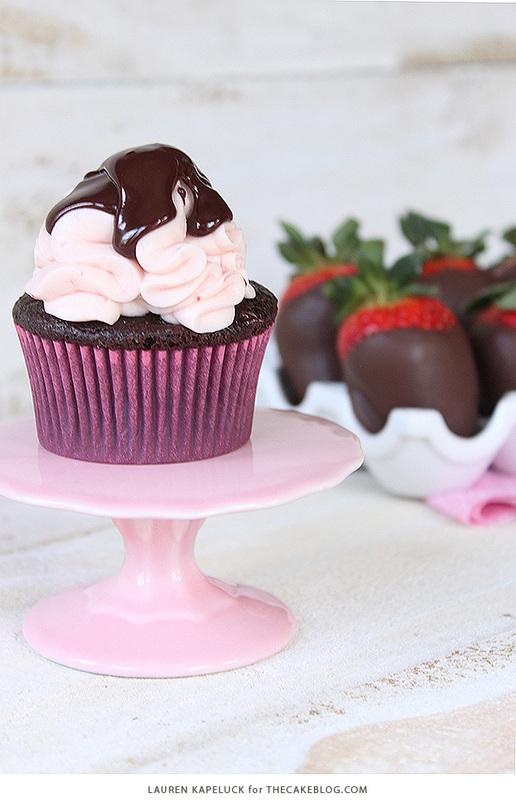 Get ready to drool over these Chocolate Covered Strawberry Cupcakes. I’ve been envisioning how to create this recipe for a while now and initially was thinking about a strawberry cake covered in chocolate ganache. But then I came to my senses and realized this is a month truly devoted to all things chocolate. So the more chocolate the better in this recipe, and decided on a chocolate cake instead. Trust me, you will thank me for this extra layer of chocolate once you sink your teeth into these babies. These cupcakes start with my go to chocolate cake recipe, that makes the most moist, delicious and addictive treat. A ruffled mound of strawberry cream cheese frosting is then piped on followed by a drizzle of chocolate ganache. 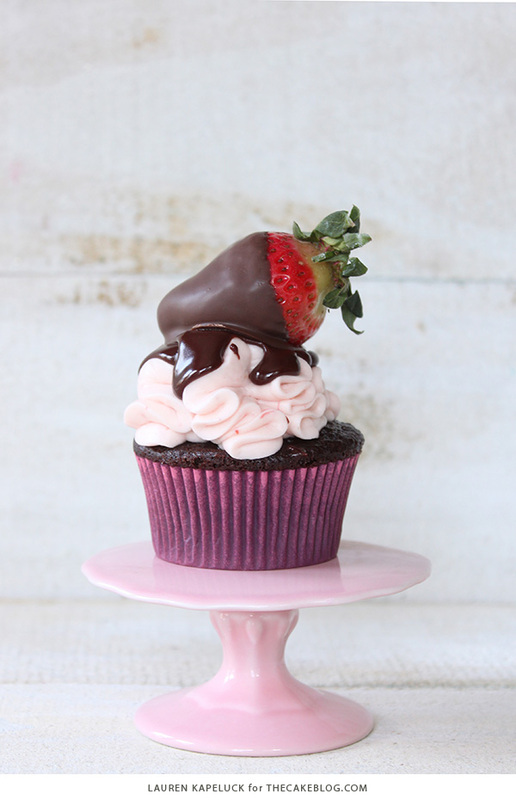 At this point these cupcakes look and taste pretty fabulous, but we can’t forget the signature chocolate covered strawberry on top. Now this is what you call one sweet, indulgent and decadent Valentine’s treat! I will warn you that this fancy cupcake does get a little messy once you try to tackle it. So you may want to go in with a fork or be prepared to come away with some chocolate ganache all over your lips! I hope you all enjoy this recipe and have a sweet Valentine’s Day! In large bowl combine all dry ingredients: flour , sugar, cocoa powder, baking soda and salt. Whisk until well combined. Add oil and sour cream and mix together with whisk. Gradually add water and continue to whisk. Add vanilla and eggs and whisk until combined. Fill cupcake lines 2/3 full with batter. Bake for 16 minutes or until toothpick inserted in center comes out clean. 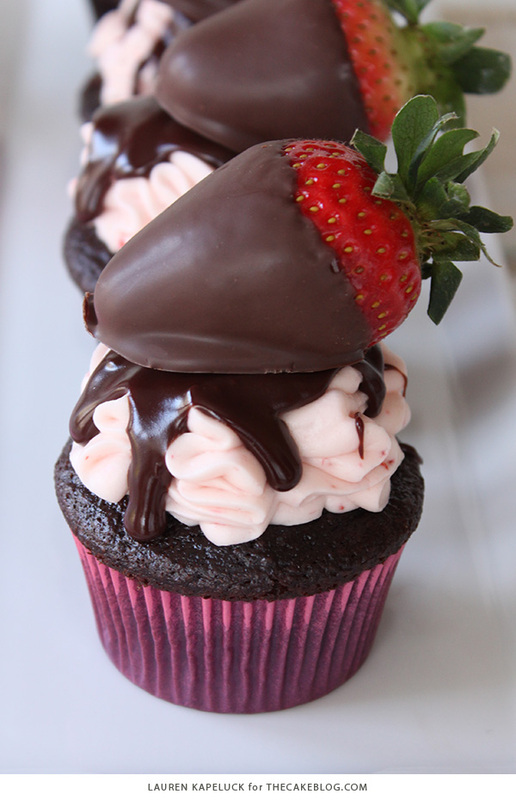 Once cupcakes are completely cool frost with Strawberry Cream Cheese and Chocolate Ganache. In bowl of stand mixer combine butter and cream cheese and beat on medium speed until creamy. Add strawberry puree and vanilla and mix until combined. Gradually add confectioner’s sugar 2 cups at a time and mix until well combined. Place frosting in piping bag fitted with Wilton tip 2D. Hold piping bag straight above cupcake and squeeze and wiggle piping bag slightly and pull straight up to create the ruffled look. Place cupcakes in refrigerator for about 15 minutes to let the frosting set up. Place heavy cream and corn syrup in saucepan and heat over medium-high heat just until simmering. Put chocolate chips in bowl. Pour cream over top of chocolate chips and let sit 5 minutes, do not stir. Once chocolate begins to melt, stir mixture until chocolate is completely smooth. 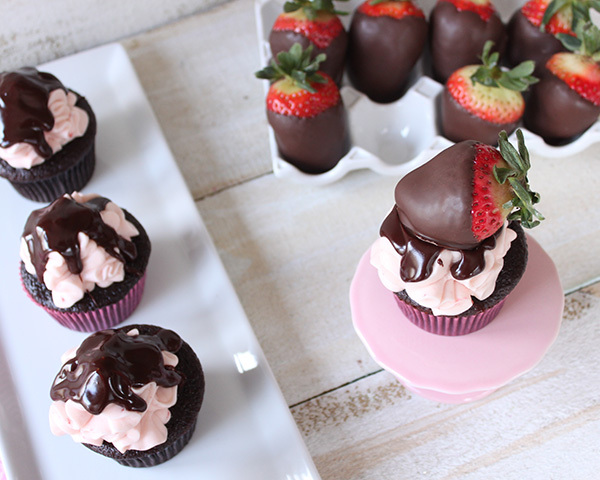 Allow chocolate to cool and firm up a little bit before drizzling over top of cupcakes. Place Dark Chocolate Melting Wafers in bowl and microwave in 30 second intervals stirring after each, for about 1 and a half minutes, until chocolate is smooth. Dip strawberries in melted chocolate so they are about 3/4 the way covered. Place strawberries on prepared baking sheet. 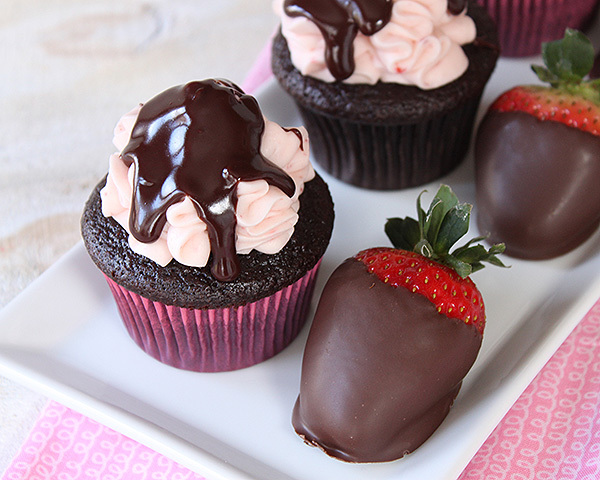 Once all strawberries are dipped place in refrigerator for 10-15 minutes to allow chocolate to set. 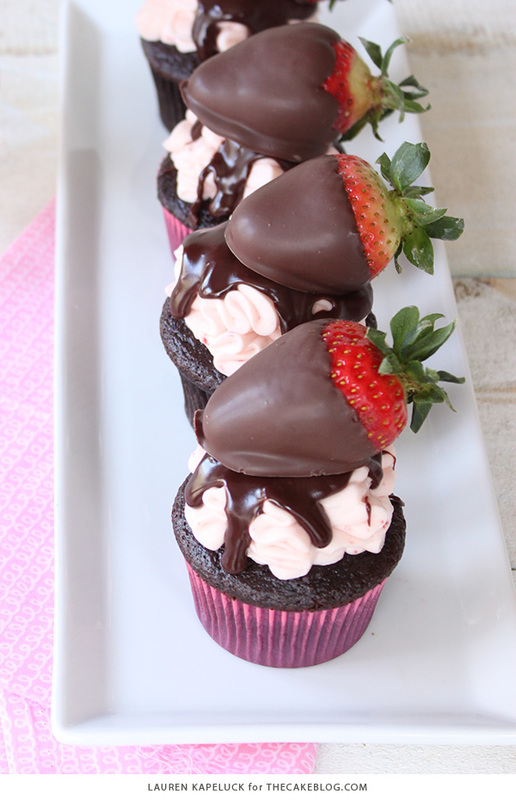 Add Chocolate Covered Strawberries on top of cupcakes. Keep cupcakes stored in air tight container in refrigerator until ready to enjoy. Whoa! That looks like decadent, over-the-top, sweet awesomeness!! Strawberry cream cheese frosting might be my favorite part of it though. That sounds incredible. oh my goodness. These look like perfection in a few bites. 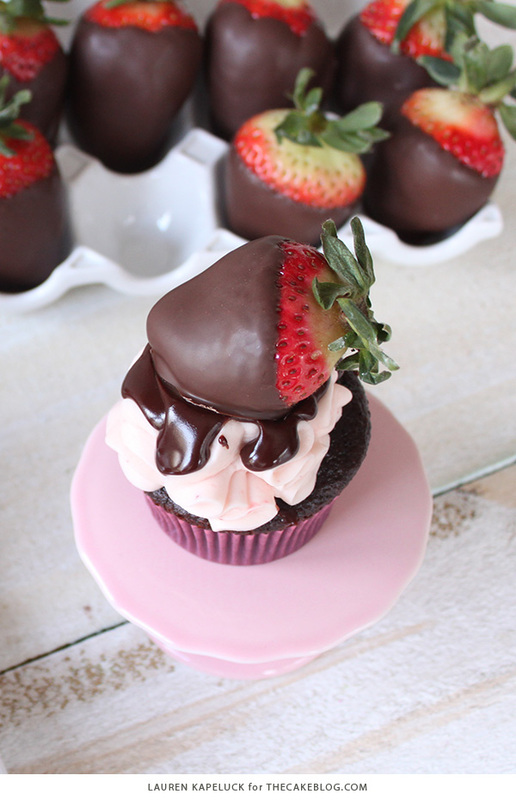 Chocolate covered strawberries are the perfect valentines dessert, so how cute are these?! I’ve wanted to try making strawberry frosting but have been afraid, but I don’t think I can pass this recipe up! The frosting is really runny. The cake is moist and soft but is there any way to make enhance the flavour?? If your frosting is runny, there could be one of two problems. 1. Your butter and/or cream cheese got too warm. Pop it into the refrigerator and let it chill for a bit and see if it is thick enough for you. 2. There is too much moisture from your strawberry puree. Add some additional powdered sugar and the frosting will thicken. Hey there!!! Working on these cupcakes tonight! Is the strawberry puree made while they are frozen or thawed? I would let the the strawberries thaw so that you can run them through a food processor with ease. Alternatively, you could use fresh strawberries as well. Just pulse them in a food processor and then measure out the 5 tablespoons of puree. This was the first recipe I looked at when looking up cream cheese cupcakes. Needless to say, I gave it a go and on first try they have been the most delicious cupcakes I’ve ever had/made! I’m a little surprised at myself with how fantastic they came out. The cake was moist and full of flavor, and the frosting was just right; it could have been a bit thicker but it wasn’t enough to top and not run!!! Have these in the oven now. We will see what happens. Im very concerned about the consistency of the batter. I was like water! Did anyone else have this issue? Did they cook up ok even with the large amount of water called for in the recipe? Yes and although taste was yummy, the cupcakes fell as they cooled. Texture in mouth was as if it wasn’t fully cooked, although it was. I may attempt this again but with 1/2 the water or less. i just made these and they came out perfect. Since it is 80 degrees in this house, after frosting every 4 cupcakes, I had to keep putting the frosting back in the fridge. I also added one tablespoon of meringue powder to the frosting and the turned out beautifully. Thank you for sharing your recipe! I made these last year for valentines day. I’m getting ready to make them again. They turned out great. Easy to make and so delicious. They were a BIG hit with my husband and kids. Thank you for the recipe. A lot of work but very good. For some reason my guys didn’t like them though. Bummer. These might be the best thing I’ve ever tasted.